An cool old skool looking vending machine with re-useable and music filtering hearing protection. 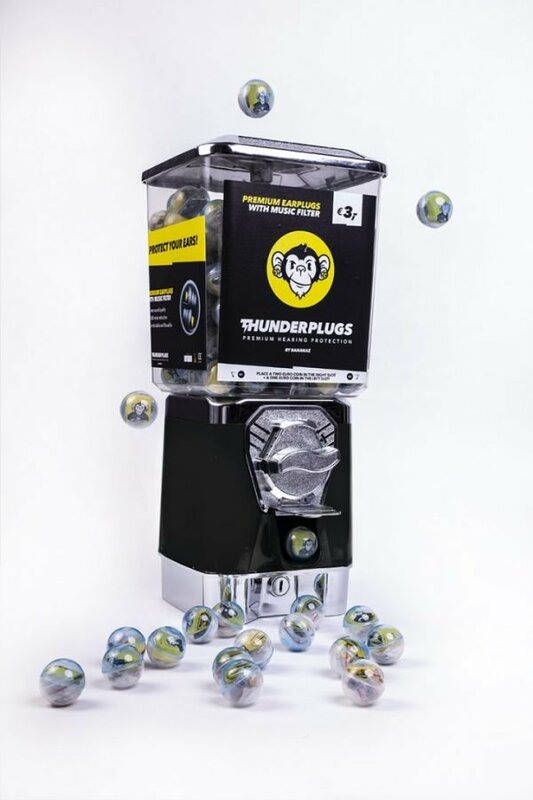 200 pair of Thunderplugs© for in the club, bar or concert hall! As an owner you are responsible to have hearing protection available in your venue. The Thunderplugs vending machine is the perfect solution for club, bar and concert hall owners. Visitors and staff and can now easily purchase re-usable music filtering earplugs. For only 2x €2,- music lovers can protect their ears against hearing loss & tinnitus caused by music! Due to the special music filters the sound will be reduced by -18 decibels without distorting the sound. Easy to buy, low costs, cool design, a bit of profit and a responsible high quality service towards club-goers. Thunderplugs suits to all safety requirements by EU and US regulations. Tested and certified with the EN 352-2 standard and ANSI.